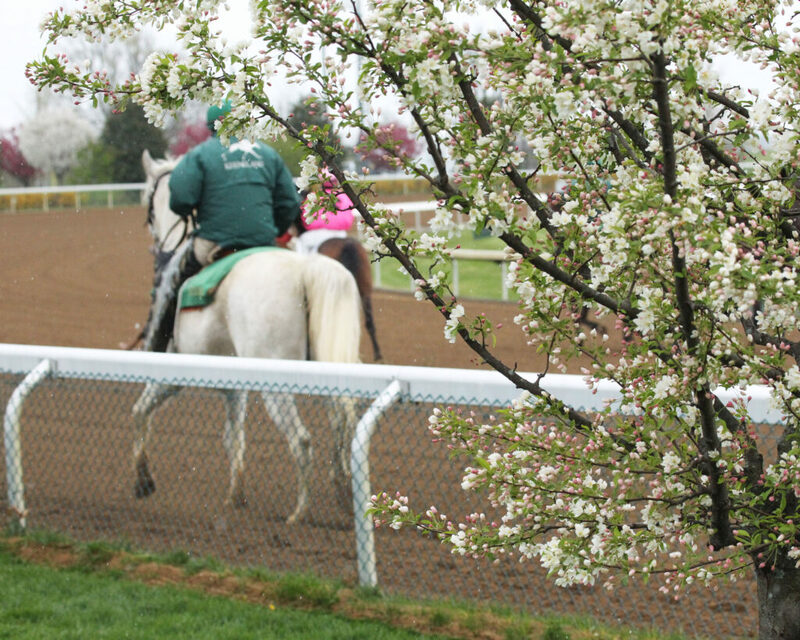 Keeneland’s 2019 Spring Meet opens Thursday, April 4, with a 3 p.m. ET first post. First post for the remainder of meet is 1:05 p.m. The 16-day season runs through Friday, April 26.
for Keeneland’s April 4-7 opening weekend stakes. 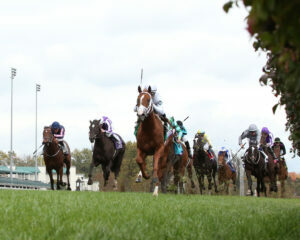 Click here for the Toyota Blue Grass (G2) Weekend microsite dedicated to Keeneland’s April 4-7 opening weekend stakes. The Thursday opener means the Spring Meet will not lose a day because of Easter Sunday, April 21, when Keeneland is closed. Prior to 1960, the Spring Meet often opened on Thursday when the season was shorter. Opening day for the 2019 Spring Meet will be a community-wide celebration starting with an afternoon of eight races. Music in partnership with The Burl, a popular live music venue in Lexington, will be featured in the Paddock area. Drink specials also will be offered. Following the day’s final race, the popular Central Bank Thursday Night Live at Keeneland will begin in the Paddock area. This marks the first time the event will be held here. Jockey Autograph Signing: 1:30-2:30 p.m. Racing fans can meet jockeys competing at Keeneland as well as retired jockeys – from Hall of Famers to history makers and Keeneland favorites – and participate in an autograph signing to benefit the Permanently Disabled Jockeys Fund. Event takes place in the area outside the Walking Ring. Feature race: Post time is 6:18 p.m. for the inaugural running of the $100,000 Palisades Turf Sprint, a 5½-furlong turf race for 3-year-olds. Central Bank Thursday Night Live at Keeneland: The Zach Longoria Project will perform in the Paddock area from 7-8:30 p.m.
WinStar Farm, China Horse Club and SF Racing’s Bulletin, winner of last fall’s Breeders’ Cup Juvenile Turf Sprint at Churchill Downs, will make his 2019 debut Thursday when he headlines a field of 14 and two also-eligibles for the inaugural running of the $100,000 Palisades Turf Sprint for 3-year-olds. 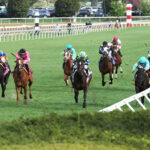 The 5½-furlong grass test will serve as the opening-day feature of the 16-day Spring Meet, which runs through April 26. First post time Thursday is 3 p.m. ET with the Palisades scheduled as the seventh race with a 6:18 p.m. post time. Trained by Todd Pletcher, Bulletin is undefeated in two starts, winning the Hollywood Beach at Gulfstream going 5 furlongs in his debut last September. Javier Castellano, who was aboard for the Breeders’ Cup victory, has the mount and will break from post position 12. Hat Creek Racing’s Chelsea Cloisters, who finished second, beaten 2¾ lengths by Bulletin, in the Breeders’ Cup, will challenge the boys again Thursday. Trained by Wesley Ward, Chelsea Cloisters will break from post position 13 and be ridden by Albin Jimenez in her 2019 debut. Also making his 2019 debut in the Palisades is John Oxley’s Strike Silver. Winner of the Indian Summer here last fall, Strike Silver endured a troubled trip in the Breeders’ Cup Juvenile Turf Sprint and finished seventh behind Bulletin. Trained by Mark Casse, Strike Silver will be ridden by Julien Leparoux and break from post position 11. The field for the Palisades Turf Sprint, with riders and weights, from the inside is: Yes I Am Free (Tyler Gaffalione, 118 pounds), Vivid Verse (Adam Beschizza, 118),Tobacco Road (Corey Lanerie, 118), Joyful Heart (Luis Saez, 118), Vogt (Florent Geroux, 118), Real News (Joel Rosario, 118), Hawaiian Noises (Luan Machado, 118), Gladiator King (Leonel Reyes, 118), Abyssinian (John Velazquez, 118), Mick’s Star (Brian Hernandez Jr., 118), Strike Silver (Leparoux, 118), Bulletin (Castellano, 123), Chelsea Cloisters (Jimenez, 118) and Dom Carlos (IRE) (Jose Ortiz, 118). Also–eligible: Uncapped (Gaffalione, 118) and Front Office (Robby Albarado, 118). Live Oak Plantation’s Win Win Win is preparing to hit the road again, this time heading west to Kentucky from his home base at Fair Hill Training Center in Elkton, Maryland. “We are leaving tomorrow and should be there Wednesday morning,” trainer Mike Trombetta said Monday morning. The purpose of the trip is Saturday’s $1 million Toyota Blue Grass (G2), which offers 170 qualifying points toward the $3 million Kentucky Derby Presented by Woodford Reserve (G1) on a 100-40-20-10 basis to the first four finishers. Win Win Win picked up 10 points with his third-place finish in the Lambholm South Tampa Bay Derby (G3) in his most recent start March 9. That 10-point total puts Win Win Win at 31st on the leaderboard for the Derby, which is limited to the top 20 point earners that pass the entry box. Win Win Win, who set a Tampa Bay track record with his 7¼-length victory in the 7-furlong Pasco, had his final prerace work Saturday at Fair Hill, going 5 furlongs in 1:01.60 over the all-weather surface. Calumet Farm’s homebred Oxy Lady will bypass Saturday’s $500,000 Central Bank Ashland (G1) in favor of the $500,000 Fantasy (G3) at Oaklawn Park on April 12, according to trainer Jack Sisterson. “She is definitely not running this weekend,” Sisterson said of Oxy Lady, who worked 5 furlongs in 1:01 on Friday in her first breeze since finishing second in the Busher at Aqueduct on March 9. Nine stakes worth $2.85 million will be run during the opening week of Keeneland’s 16-day Spring Meet that opens Thursday, April 4. Click here for the lists of nominations and past performances for the stakes. $150,000 KENTUCKY UTILITIES TRANSYLVANIA (G3) (Entries taken Tuesday; race Friday, April 5 – Dunph (Mike Maker), Go Away (Eddie Kenneally), Henley’s Joy (Maker), Louder Than Bombs (David Fawkes), Magnificent McCool (Steve Asmussen), More Ice (Jerry Hollendorfer), Spectacular Gem (James Baker), The Black Album (FR) (Rodolphe Brisset), War Film (Asmussen) and Weekly Call (Doug O’Neill). $1 MILLION TOYOTA BLUE GRASS (G2) (Entries taken Wednesday; race Saturday, April 6 – Admire (Dale Romans), Chess Chief (Stewart), Dream Maker (Mark Casse), Hoffa’s Union (Casse), Lucky Lee (John Servis), Market King (D. Wayne Lukas), Mr. Ankeny (Romans), Moonster (Romans), Parsimony (Doug O’Neill), Signalman (Kenny McPeek), Sir Winston (Casse), So Alive (Todd Pletcher), Somelikeithotbrown (Mike Maker), Vekoma (George Weaver) and Win Win Win (Michael Trombetta). Possible: Galilean (Jerry Hollendorfer), Joevia (Greg Sacco) and Tax (Danny Gargan). 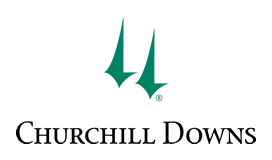 $250,000 COMMONWEALTH (G3) (Entries taken Wednesday; race Saturday, April 6) – Bobby’s Wicked One (Al Stall Jr.), Copper Town (Todd Pletcher), Limousine Liberal (Ben Colebrook), New York Central (Steve Asmussen), Rickiesinthehouse (Larry Rivelli), Runaway Ghost (Todd Fincher), Still Having Fun (Tim Keefe), Storm Advisory (Anthony Quartarolo), Uno Mas Modelo (Quartarolo) and Warrior’s Club (D. Wayne Lukas). $200,000 SHAKERTOWN (G2) (Entries taken Wednesday; race Saturday, April 6) – Angaston (Lon Wiggins), Bound for Nowhere (Wesley Ward), Captain Scotty (Peter Miller), Chaos Theory (Brendan Walsh), Disco Partner (Christophe Clement), Imprimis (Joe Orseno), Jazzy Times (Wes Hawley), Latent Revenge (Greg Foley), Richard’s Boy (Miller) and Shakhimat (Roger Attfield). $200,000 APPALACHIAN (G2) PRESENTED BY JAPAN RACING ASSOCIATION (Entries taken Thursday; race Sunday, April 7) – Angel Alessandra (Peter Miller), Beautiful Ballad (Mark Casse), Catch a Thrill (Casse), Clause (Chad Brown), Hard Legacy (Norm Casse), Primela (FR) (Cherie DeVaux), Princesa Carolina (Kenny McPeek) and Regal Glory (Brown). The Keeneland Shop’s A Taste of the Races – From 4:30-7:30 p.m., shoppers will enjoy specialty spring cocktails provided by Grey Goose. The first 200 attendees will receive a complimentary cocktail in the all-new Keeneland Heritage Catstudio glass as a gift. Shoppers also will receive an exclusive 20-percent discount on all in-store purchases (some exclusions apply), on-site personalization from Barbour and other special offers. Saturday, April 6 Sunrise Trackside – The day begins early for racehorses. Keeneland invites you and your family to experience their mornings with Breakfast With the Works, which features breakfast for purchase and trackside commentary (7-8:30 a.m.) while horses train on the main track. The event includes children’s activities in the Kids Club Corner (7:30-9:30 a.m.); guided Keeneland tours that depart from the welcome stand near the Paddock (7:30-10 a.m.) and Paddock demonstration of a farrier from Rood & Riddle Equine Hospital (9-9:30 a.m). Parking and admission to the morning events are free. TVG-PDJF Telethon – Hall of Fame jockeys and TVG personalities at Keeneland and Santa Anita will participate in a second telethon to raise money for the Permanently Disabled Jockeys Fund (PDJF) live on TVG. Racing fans and industry stakeholders may call, chat and contribute at 1-844-TVG-PDJF from noon to 7 p.m. ET. 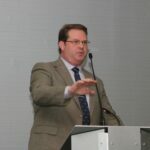 Donations are accepted any time at https://pdjf.org/donate/. Last year’s inaugural telethon raised nearly $230,000.